In 1951, Bill Valentine became the youngest professional umpire in baseball history at the age of 18. ST. PETERSBURG, Fla. -- Minor League Baseball announced today that Bill Valentine, a current vice president of the Texas League and former Arkansas Travelers executive, has been named the 2014 King of Baseball. The King of Baseball is a long-standing tradition in which Minor League Baseball recognizes a veteran of professional baseball for long-time dedication and service. Valentine will receive the King of Baseball Award at the Baseball Winter Meetings Banquet on Sunday, Dec. 7, at the Hilton San Diego Bayfront in San Diego, California. "I attended my first Baseball Winter Meetings in 1977, and since then, I have seen 36 people selected as the King of Baseball," said Valentine. "To be honest, during the early years, I had no thoughts of being in the game long enough to be crowned King. I do appreciate the honor and cannot wait to get to San Diego and my 37th Baseball Winter Meetings." Bill grew up at Travelers Field in Little Rock, Arkansas, working various jobs, including clubhouse attendant, ball shagger and concession worker. After graduating from North Little Rock High School, he attended umpire school and became the youngest professional umpire in baseball history in 1951 at the age of 18 when he was signed by the Ohio-Indiana League. In 1963, after years of progressing through the umpiring ranks, Valentine landed in the American League, where he remained until 1968. In 1969, Valentine returned to Little Rock, where he spent the next eight years on the air for Travs broadcasts. He also worked as a television sportscaster and radio disc jockey on KARK (now KARN News Radio) in Little Rock, did some sports writing for the Arkansas Democrat and was executive director of the Arkansas Republican Party. "After umpiring for 18 years, I began broadcasting Arkansas Travelers games in the Texas League," stated Valentine. "In 1976, after then General Manager Carl Sawatski was elected president of the Texas League, I became the General Manager and Executive Vice President of the team." The Executive Committee of the fan-owned Travs hired Valentine to replace Sawatski for the 1976 season. In his first five years at the helm, the team's attendance increased by more than 150,000 and by 1980, the Travelers' attendance exceeded 223,000, nearly four times what it had been before Valentine arrived. With increases in both fan numbers and ticket sales, Ray Winder Field was able to be renovated to include new restrooms, clubhouses and playing surfaces, all due to the hard work and commitment of Valentine. Valentine was a pioneer in the area of promotions, introducing many giveaway nights and special events to Travelers games. He was rewarded for his knack for marketing in 1983 when he and the Arkansas club were named the recipients of the Lee MacPhail Trophy, which is awarded to baseball's top promoter. The Arkansas Travelers were the top draw in the Texas League during the 1980s. After carrying the team to numerous league championships that decade, Valentine was named the 1989 Double-A Executive of the Year by Sporting News. In 1990, the Arkansas Travelers were recognized by Baseball America with the coveted Freitas Award that acknowledges one organization's long-term stability and success. Following the 2000 season, Valentine signed an agreement to make the Arkansas Travelers the Texas League affiliate of the Los Angeles Angels, which ended the 35-year relationship the team shared with the St. Louis Cardinals. During the first year of the new affiliation, the Travs ended an 11-year drought by winning a league championship under the leadership of Valentine. In August 2005, the voters of North Little Rock approved a two-year, one-cent sales tax to build a new home for the Travelers. 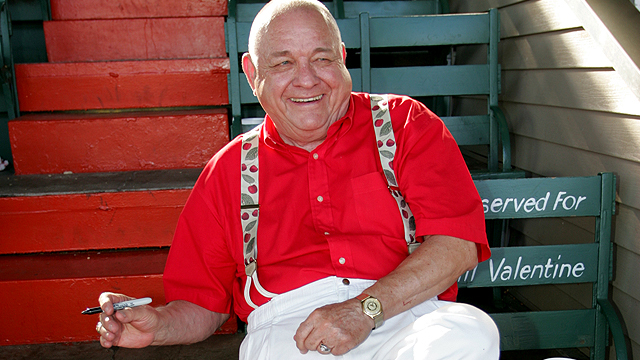 Bill was instrumental in the construction of Dickey-Stephens Park, where the team began playing in the 2007 season. Due to his diligence and attention to detail, Bill was one of the driving forces that contributed to the success of the project. After completing its eighth season in the downtown riverfront, the ballpark has been a worthy successor to Ray Winder Field. In his 33 years of leading the Arkansas Travelers, Valentine has been recognized many times by his peers and the community, including being inducted into the Arkansas Sports Hall of Fame and the Texas League Hall of Fame. Valentine has been voted Texas League Executive of the Year six times and was awarded the George Troutman Award in 1994 for long and distinguished service to baseball. Valentine took on the role of the Chief Operating Officer of the team prior to the beginning of the 2007 season and retired from the team in 2009. He also served as the Texas League's representative on Minor League Baseball's Board of Trustees. Valentine's impact on the game changed, and undoubtedly bettered, the face of baseball in Central Arkansas. "What an extraordinary career Bill has had as an umpire, broadcaster and award-winning club operator," said Texas League President Tom Kayser. "He was at the forefront of the revival of The Minor Leagues and throughout his career, one of the game's leading promoters. Bill also helped operators share their best ideas, organizing the first promotional seminar at the Baseball Winter Meetings in the 1970s." "Bill Valentine has held practically every job in baseball one could imagine," said Pat O'Conner, Minor League Baseball President & CEO. "His reputation as a fiery Major League umpire may have been well-deserved, but it was Bill's ability as a baseball executive that was really showcased in his years in Little Rock. Bill made the most of an aged Ray Winder Field while working diligently on a new ballpark in North Little Rock. The successful opening of Dickey-Stephens Park in 2007 capped an amazing career for this year's King of Baseball."